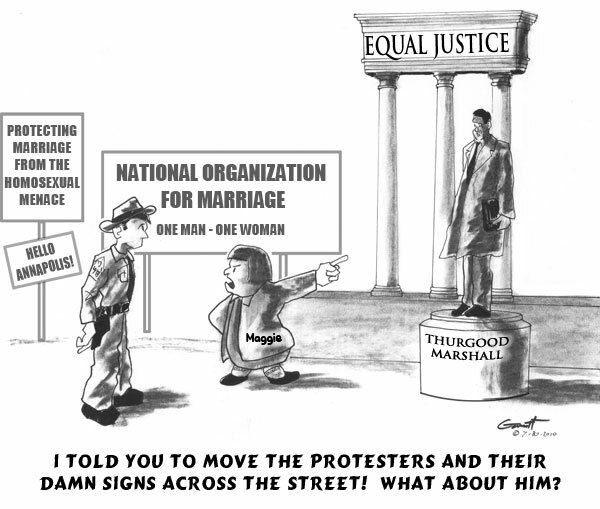 Thurgood Marshall was one of this century’s foremost leaders in the struggle for equal rights under the law. A native of Baltimore, Marshall graduated from Frederick Douglass High School in Baltimore and Lincoln University in Pennsylvania. He earned his law degree from Howard University in Washington, D.C. where he first met the great civil rights lawyer Charles Houston. 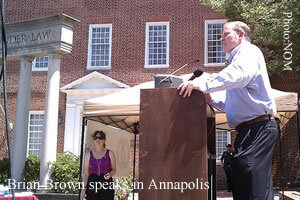 After earning his law degree, Marshall returned to Baltimore and began his long association with the NAACP. In 1967, Marshall became the first African American to be appointed to the U.S. Supreme Court.Following Marshall’s death in 1993, the state of Maryland decided to honor the great civil rights leader and jurist with a memorial at the State House in Annapolis. On May 17, 1994, exactly 40 years after the Supreme Court’s Brown v. The Board of Education of Topeka decision, the governor of Maryland signed an Executive Order establishing the Thurgood Marshall Memorial Statue Commission. After a nationwide competition, the Commission awarded the design of the memorial to Maryland artist Toby Mendez. Mr. Mendez’s winning design includes an 8′ statue of Thurgood Marshall as a young lawyer. 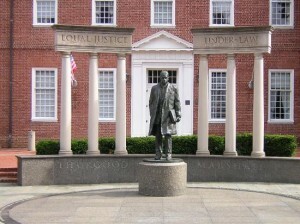 Behind him are pillars with the inscription “Equal Justice Under Law” and facing him are two benches. On one of the benches is the figure of Donald Gaines Murray whose entrance into the Law School of the University of Maryland marked Thurgood Marshall’s first important victory in his struggle for school integration. On the other bench are the figures of two children representing Marshall’s most important achievement, Brown v. The Board of Education of Topeka et. al.. Within the circle of the plaza is a chronology of the important events in Thurgood Marshall’s long and distinguished career. You can just imagine the folks on those two benches looking over with bewilderment at the little group of earnestly heterosexual Americans exhorting anyone who would stop and listen that America isn’t really the land of the free unless some Americans are more equal then others.